If you’re looking for a vehicle that can perform in off-road environments and on treacherous terrain, look no further than the 2017 Jeep Wrangler. The Wrangler is a tough and durable vehicle with a lot of personality thrown in. The interior has enough features to keep passengers comfortable, regardless of the driving conditions you may encounter outside. Multiple trims, body types, and equipment options mean there’s a 2017 Wrangler for everyone. The Wrangler’s bold styling reflects it adventurous spirit, the perfect match for your busy lifestyle. If you’re looking for a functional vehicle that can also handle camping on the weekends or exploring the countryside, the 2017 Jeep Wrangler is definitely for you. The 2017 Jeep Wrangler is powered by a powerful 3.6-liter V6 engine which offers up to 285 horsepower and 260 pound feet of torque. The standard transmission is a six-speed manual with hill-start assist. There is also an optional automatic transmission, that comes standard with hill-start assistance and hill-descent controls as well. The 2017 Jeep Wrangler comes equipped with a Dana 30 front axle and a Dana 44 rear axle on both the Sport and Sahara models. On the Rubicon trim levels the Dana 44 is standard for both axles. Off-road environments are where the Wrangler really shines, and it comes with a wide variety of equipment to further support it when traversing difficult terrain. The NV241 COMMAND-TRAC part-time, two-speed transfer case comes standard on the Sport and Sahara trim levels and helps the Wrangler in situations that require more traction by offering more torque. It has a low-range gear ratio of 2.72:1. The Rubicon trim level replaces that transfer case with the NV241OR ROCK-TRAC which features a 4.0:1 low-range gear ratio instead. 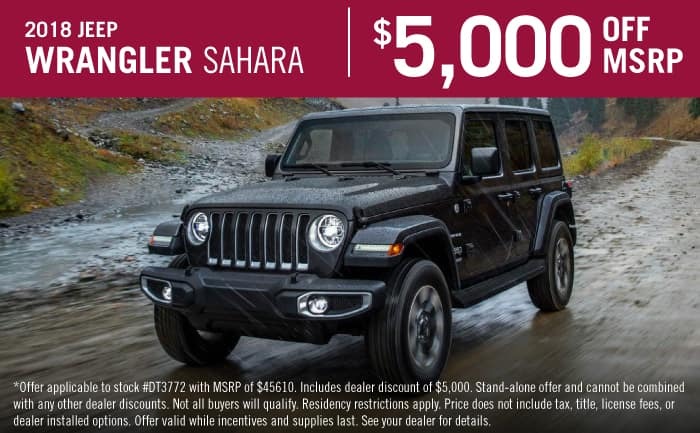 Off-road capability isn’t the only thing the Jeep Wrangler has to offer, as this ruggedly refined option comes wrapped in design elements that are typical of the Jeep brand. The Jeep Wrangler is capable of taking passengers to many scenic locations, while providing them with a homey vantage point from which to enjoy the view. The Wrangler can come in one of two body types. The Jeep Wrangler has two doors and can accommodate four passengers. Alternatively, the Wrangler Unlimited has four doors and enough seating for five passengers. The exterior comes standard with tow hooks, foglights, a fold-down windshield, full metal doors with crank windows, manual mirrors and locks, skid plates and 16-inch steel wheels with on/off-road tires. The Rubicon trim level offers added features to maximize its off-road capabilities and augment the comfort of the interior. It comes standard with 17-inch alloy wheels, LED headlamps, a leather-wrapped steering wheel, and a bunch of off-road items like an electronic front and rear locking differential and its upgraded transfer case. How much horsepower does the Jeep Wrangler offer? The Wrangler can generate up to 285 horsepower! All 2017 Jeep Wrangler models come standard with antilock brakes, traction and stability control, and front airbags, while some trim levels get front-side airbags as standard inclusions. As far as off-road performance goes, the Jeep Wrangler is in a class of its own. Its distinct look helps to articulate its adventurous and rugged persona. Its impressive four-wheel-drive system is a standout feature allowing it to go places few others can go and traverse terrain that would surely stop its competition. Stop by Texan Dodge Chrysler Jeep RAM and try out your Wrangler today.